PRODESA is an engineering and manufacturing company specialized in the supply of Thermal drying Turnkey plants. 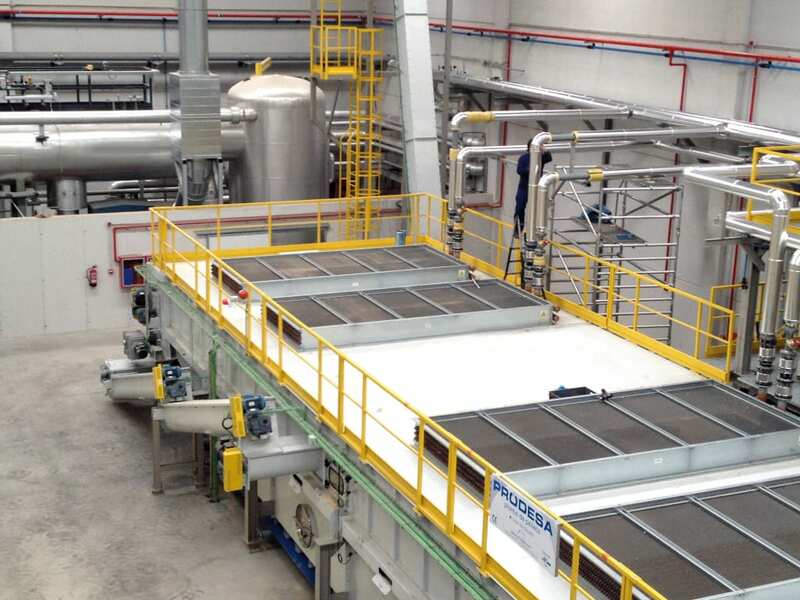 The low temperature belt dryer is a technology that enables the use of waste energies from other processes such as hot air (direct), hot water or steam (indirect). This makes the belt dryer a suitable technology to be combined with cogeneration plants: CHP (Combine Heat & Power) , gasification, ORC (Organic Rankine Cycle), etc. Besides, as it works with low temperatures, it keeps the physical and chemical product properties unaltered. This represents an advantage especially for the wood sector, as it enables to produce high quality wood pellets. PRODESA works as licensee of the Swiss company W. Kunz dryTec AG, leader in the agroiindustrial dehydration market that commercialises its products under the brand name Swiss Combi with a 50-year experience. The direct drum dryer is a high temperature drying technology. The drum dryer is a classic drying technology, and it has a high energy efficiency. The exhaust gases coming from a furnace, a NG burner or other processes enter directly the drum, and together with the wet product passes through it. At the drum’s outlet a gas treatment system is required to separate the product from the gas stream and avoid particle emission to the atmosphere, as well as VOC’s. PRODESA works as licensee of the Swiss company W. Kunz dry Tec AG, leader in the agro-industrial dehydration market that commercialises its products under the brand name Swiss Combi with a 50-year experience. The EcoDry system consists in drying in a sealed steam cycle with an integrated thermal oxidation. Separating the chimney gas from the drying gas has the indirect drying advantages (for instance, no contact between the chimney gas and the material to be dried, free fuel choice), as well as the direct drying ones, combining both to obtain the best advantages. This system is recommended for drying products that generate unpleasant odours, VOCs emissions and any kind of toxic or hazardous emission.